OMAHA, Neb. — For the second straight year, the official announcement of the 2014 Outland Trophy semifinalists will be made at a reception on Nov. 20 at DJ’s Dugout, 10th & Capitol Avenue. The Football Writers Association of America will conduct the voting and selection process to determine these players. The Outland Trophy semifinalists announcement of six or seven players will lead into ESPNU’s announcement of the three finalists on Nov. 25. 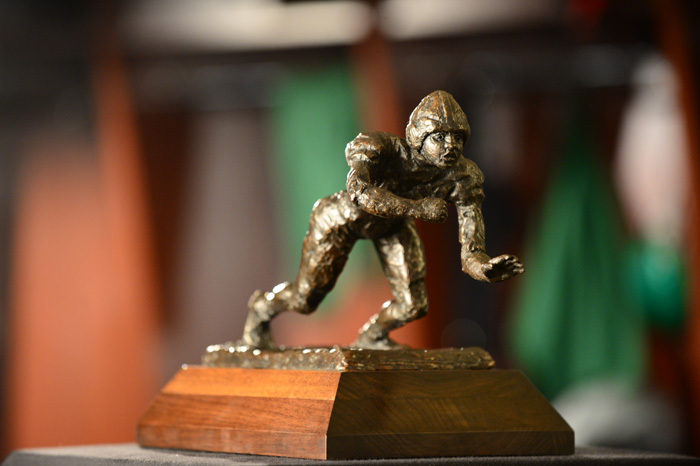 The winner will be revealed during ESPN College Football Awards on Dec. 11. The Outland Trophy Dinner will be held in Omaha on Jan. 15, 2015, at the DoubleTree Hotel Downtown. The Greater Omaha Sports Committee is excited to have this opportunity to recognize these outstanding players who will seek to become the 69th winner of this prestigious trophy, the third oldest player award in major-college football. The Outland Trophy Award Dinner, hosted in Omaha for the last 17 years, will be the site of the presentation again. These unsung heroes work hard every day and don’t always receive the deserved attention and recognition for their hard work, sweat and blood, poured into battle every Saturday, for a game that is won or lost in the trenches. The one that rises to be the Best, the unsung hero, the Outland Winner! The Outland Trophy Award Dinner’s emcee, Greg Sharpe, Voice of the Huskers, will also be the Master of Ceremonies at the semifinalist reception. The audience will include a number of familiar faces in the Omaha Sports Community, including former FWAA President Tom Shatel of the Omaha World-Herald and incoming 2015 FWAA President Lee Barfknecht of the same paper, members of the Outland Trophy Award Dinner Committee, Rotary Club of Omaha -Downtown and the Greater Omaha Sports Committee. Area football coaches, former Nebraska players and Outland winners will be invited to attend. Details of all of the evenings’ activities are being planned. Guests will have the ability to bid on Unique Autographed Husker, Sports Packages & Outland items during a silent auction. The price of a $15 admission will include two drink tickets, hors d’oeuvres and the opportunity to claim door prizes. Our office, along with each DJ’s Dugout location in the Omaha Metro area, will have reception tickets for sale. Ask about a group discount. Simply contact Mike Mancuso at the Greater Omaha Sports Committee (402) 346-8003. For the 18th consecutive year, Omaha will present the Outland Trophy Award to college football’s top interior lineman. Tickets are $75.00 and tables of ten sell for $750.00. Also appearing at the dinner for the 17th straight year will be the winners of Nebraska’s football senior awards – the Novak Trophy, the Chamberlin Trophy and the Cletus Fischer Native Son Award. Cornhusker Coach Bo Pelini and Nebraska assistant football coaches will be invited to attend. Outland winners from 1946 -1987 received only plaques. So Downtown Rotary-Omaha, in conjunction with the Greater Omaha Sports Committee, the Omaha World-Herald and Cox Communications, for a number of years has presented a former winner with his trophy at the dinner. This January, Ross Browner, the 1976 Outland winner from Notre Dame, will receive his trophy in Omaha. Click here for the Greater Omaha Sports Committee’s reception flier.